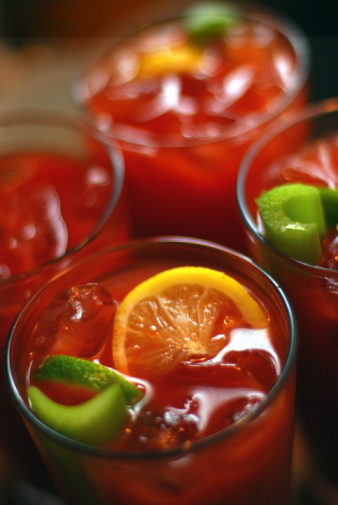 Frank Bruni’s Tipsy Diaries article was about the Bloody Mary this week. It was great to see folks moving beyond plain-old vodka as the base. Bruni found everything from gin to rye to whiskey to oatmeal stout. Celery and lemons aren’t exciting enough anymore, either. House-pickled vegetables are taking over; radish, asparagus, kohlrabi, the list goes on. One of my favorite bases for the Bloody Mary is unaged corn whiskey, a.k.a. white dog, and I was surprised that none of the bars he visited have caught on to how well the corny-goodness matches the sweet-tart tomato.